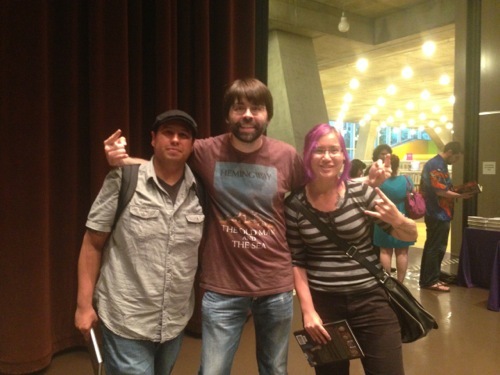 So if you didn’t catch my spastic fan posts earlier, here it is again: Joe Hill visited the Seattle Public Library! I was in good company — my wonderful friend, Frank is a major fiction and comic book fan, and he met me as the venue filled up. 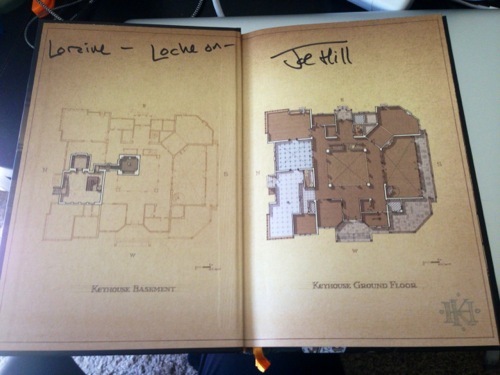 Hill read from his most recent horror novel, NOS4A2, for the majority of the event. There seemed to be a good mix of comic and novel fans in attendance, based off the types of questions people asked during the Q&A. When someone asked about how his early writing endeavors, Hill described sending Marvel an original Spider Man script when he was twelve years old. It came back with a rejection letter with some illegible scribblings from Jim Shooter. Hill would later go on to pen successful scripts for Spider Man Unlimited. Hill was refreshingly down to earth, waving to his mom and kids in the audience and talking about inspirational comics. He told stories about parenthood, staying up for days to take care of his newborn, running errands in a sleepless haze, and coming up with bizarre stories. Hill explained that his novels didn’t take off until he was in his thirties, after he had written dozens of unpublished novels. Hearing about these struggles was reassuring, it makes life as a novelist seem more accessible.